Under the Vacancies Act the President is permitted to appoint an officer to an Executive Branch position on a temporary basis holding said position for no more than 90 days WITHOUT Senate confirmation. This FACT needs to be made clear so people can understand why ACTING Atty Gen Matt Whitaker chooses to answer the questions from Sheila Jackson Lee. If she had a sliver of a clue she would not be asking him question demanding a “Yes or No” answer, in the spirit of Sen Kamala Harris, with the hopes of entrapping him. 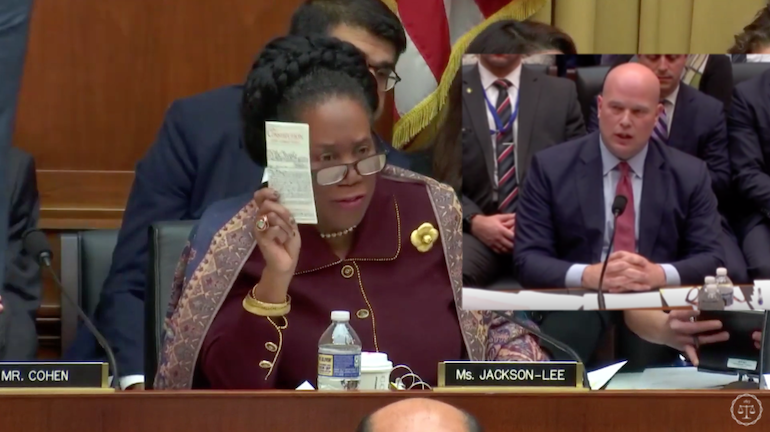 Whitaker, being far more intelligent, triggers Lee with his course of answers where she scolds him for attempting to make a joke of this JACKASS CIRCUS of a hearing. And for the record this woman has Z E R O respect for the US Constitution, how date she wave it around as if Whitaker is trampling over it! Props to Rep Collins for jumping in calling the socialist party out for their double standards. They had no problem when Lynch, Holder and other obama regime members played games during their testimony. This hearing is the first real House hearing with the new Congress under democrat control. This kind of contention, rudeness, harassment, condescension and the like is what will be going on for the next 2 years. It’s a clear indicator the division in the US will only get wider. This is supposed to be an oversight hearing but it’s clearly being used as a tool of the witch hunt against Pres Trump to dig up more dirt. GOP voters who sat home election day 2018 are responsible for this mess, YOU OWN IT.